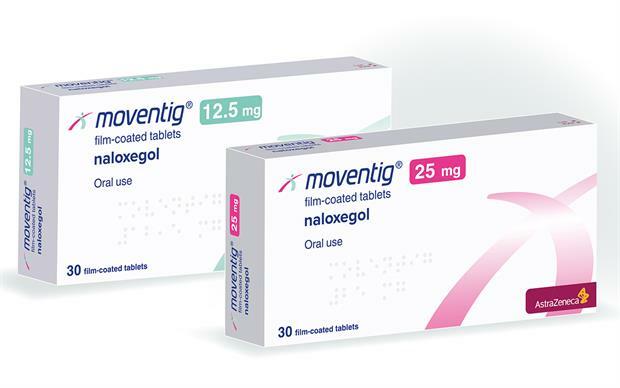 Naloxegol (Moventig) provides a new option for the treatment of opioid-induced constipation in patients who have had an inadequate response to laxatives. Naloxegol (Moventig) reduces the constipating effects of opioids without lessening their analgesic benefits. 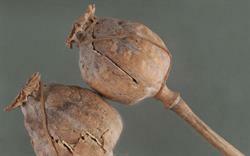 Naloxegol is a PEGylated derivative of the μ-opioid receptor antagonist naloxone. PEGylation (attachment to a molecule of polyethylene glycol, or PEG) prevents naloxegol from penetrating the CNS, allowing the drug to lessen the peripheral constipating effects of opioids without antagonising their central analgesic effects. 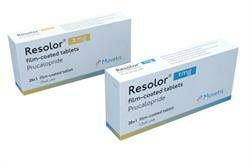 Two identical studies (KODIAC-04, n=652; KODIAC-05, n=700) were carried out in patients with non-cancer pain. Participants were randomised to receive a daily dose of either naloxegol (12.5mg or 25mg) or placebo to treat their opioid-induced constipation. At 12 weeks, response rates (defined as 3 or more spontaneous bowel movements [SBMs] per week and a change from baseline of at least 1 SBM per week for at least 9 of the 12 study weeks and 3 of the last 4 weeks) were significantly higher than placebo with naloxegol 25mg in both studies (KODIAC-04, p=0.001; KODIAC-05, p=0.02) and with naloxegol 12.5mg in KODIAC-04 (p=0.02). In KODIAC-04, the response rate was increased by 11.4 percentage points (95% CI 2.4−20.4) with the 12.5mg dose and by 15.0 percentage points (95% CI 5.9–24.0) with the 25mg dose compared with placebo. In KODIAC-05, the differences in the response rate between active treatment and placebo were 5.6 percentage points (95% CI −2.9 to 14.1) with the 12.5mg dose and 10.3 percentage points (95% CI 1.7−18.9) with the 25mg dose. Naloxegol use did not interfere with opioid-mediated analgesia. A third study, KODIAC-08 (n=804), demonstrated the long-term safety and tolerability of naloxegol. The most common adverse effects were abdominal pain and diarrhoea, which generally occurred early, resolved during or after naloxegol discontinuation, and were mild to moderate in severity. NICE recommends naloxegol as an option for treating opioid-induced constipation in adults who have not responded adequately to laxatives.